Chris Franks, ‘The North Shore Times’, published on Thursday February 14, 2019. “I write regarding the article concerning hundreds of kids being at risk of disease (‘North Shore Times’ Feb. 7). While I am delighted to see the Health Department working to help parents vaccinate on time, I am shocked that it’s necessary because parents are educated and informed of risks, backed up by news reports that regularly warn of local outbreaks of infectious diseases. 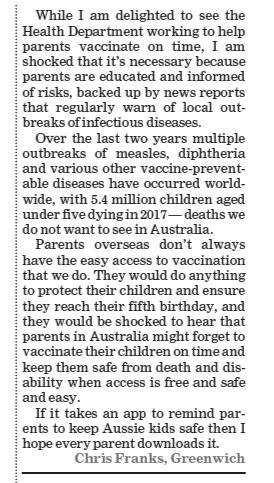 Over the last two years, multiple outbreaks of measles, diptheria and various other vaccine-preventable diseases have occurred worldwide, with 5.4 million children aged under five dying in 2017 – deaths we do not want to see in Australia. Parents overseas don’t always have easy access to vaccination that we do. They would do anything to to protect their children and ensure they reach their fifth birthday, and they would be shocked to hear that parents in Australia might forget to vaccinate their children on time and keep them safe from death and disability when access is free and safe and easy.